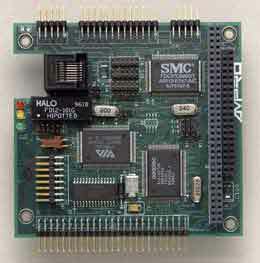 Ampro Computers, Inc.ule/SES multifunction module provides Ethernet, serial, parallel, and SCSI facilities in a single highly-integrated PC/104-compliant module. An NE2000-compatible Ethernet interface supports 10 megabits/s data transfer rates and provides direct connection to twisted pair (10Base-T) media. Two PC-compatible serial ports are implemented with 16C550-type UARTs that have 16-byte Fifo buffers for fast throughput. The parallel port is an enhanced, bidirectional port with support for IEEE-1284 standard. This port can be used as a standard PC printer port or can be programmed as a digital I/O port to provide digital sensing and/or control functions for the embedded system. The module's SCSI interface is based on the AIC6370 SCSI-II-complaint ocntroller. It supports up to 10 megabytes/sec data rates, in the fast synchronous mode and is fully supported with Bios and utility software. , 4757 Hellyer Ave., San Jose, CA 95138. Phone: 800-966-5200; Fax: 408-360-0222.